1 slider, 1 layout & easy to use theme option panel. The theme also includes 3 built-in widgets and 5 useful shortcodes. The theme is SEO Friendly and has plenty of user-friendly options. The theme also comes with a Contact Page Template which doesn’t require any setup. - Social buttons to submit posts to Facebook, Twitter, StumbleUpon, Digg, Google Buzz! - IE6 Browser Upgrade Alert! - One Click Install. No plugin required. it's really nice wordpress theme. @Castors: thanks for your visit. I have a problem with the Triton light theme. In Firefox, the entire content is in the center of the page, which is what i like. In i.e. however, it´s aligned to the left. How can I change this? Have tried, but still have not managed to find the solution. Grateful for a response. © 2011 Template For Blog. 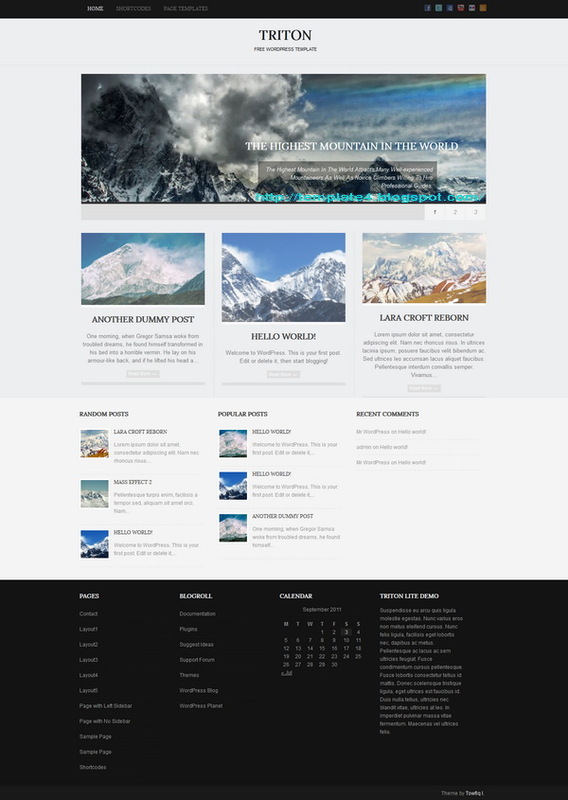 WP Themes by Skatter Tech. Bloggerized by Bambang Wicaksono.